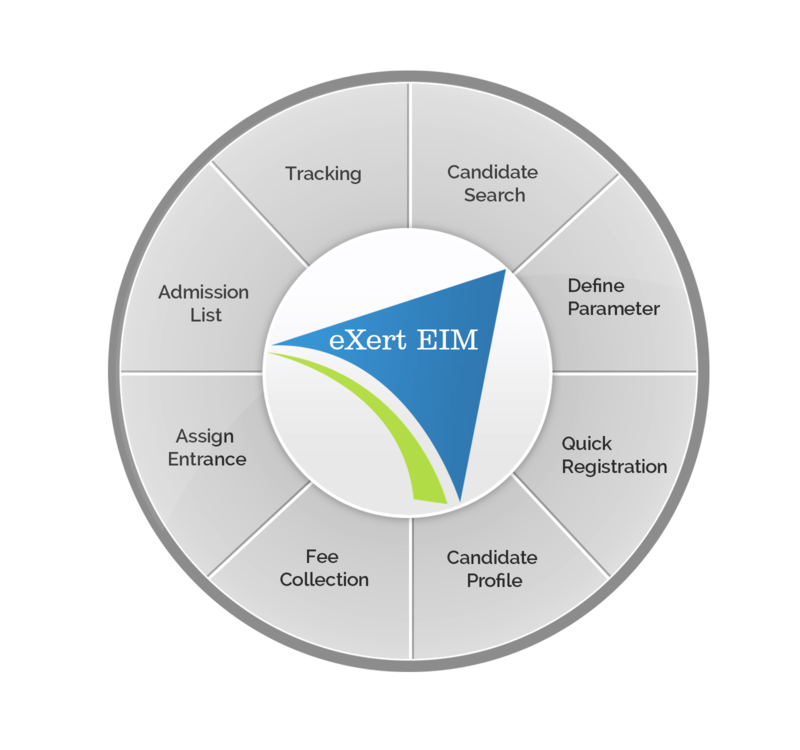 eXert EIM A web based Software Solution, Which is unparallel and comprehensive Educational Institute Software that covers each and every entity of Educational Institute. It is an interactive platform for all entities viz. Candidates, Teachers, Management, Parents, Guests and Experts of an educational institution. It is a simple yet powerful one point integrated platform that connects all the departments of institution namely office, fee counter, library, stores, academics, activity centre and so on. Helps teachers and students to better organize their daily / weekly activities.. Automation of important units like fees, library and stock can effectively eliminate any ambiguity and loss of property and liquidity of the Educational Institute. Thorough analysis of critical data via various reports for better productivity. Prints Progress Reports, Bills and Receipts. Monitor staff attendance & scheduled teaching plan. Single window to information of all operations of the Institute. Admission module is a convenient and a time saving provision to handle and track student registrations, results for written/oral tests and interviews, student results and fee receipts and issue merit list. Various types of reports are available to represent the information generated. Manages complete student portfolio maintaining students personal details, professional and history data regarding a student, his/her parents, and his/her siblings, progress through years, attendance register, online curriculum, grades etc. Manages you to maintain registers of fee receipts and outstanding amounts on a student/class basis. The fee module has a configurable structure for fines, and its calculations thereof. This module also provisions for fee waivers and optional fees and provide complete analysis with outstanding amounts. This module helps teachers to define, create examination templates and get them approved through the Head of Departments. System allows to setup formula for calculating each examination weightage/percentage and published results online. Manages the complete life cycle of employee from Recruitment to Separation. Helps administration to create different routes based on number of students and staff. Helps defining own transport fare, Adhoc expenses & manage billing. Modules helps to define unit master, lesson plans, assign, extension and submission of assignments and projects for each class and you keep track through curriculum logs. The timetable module has been designed to simplify the most time consuming task in a school, the creation of a timetable. The timetable module features dynamic generation of class/teacher timetables and provisions for a teacher substitution list for absent teachers, a list of teachers teaching a particular subject for a class/all classes, and a list of all class teachers. The information is also presented in various report formats.